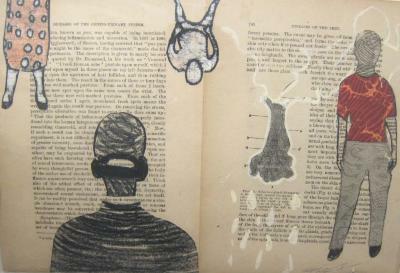 Mariella Bisson, NY Times: Times Have Changed, Collage, X , 2008. 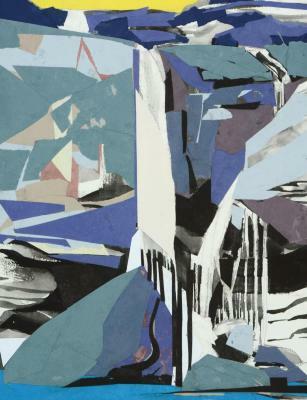 Mariella Bisson, Waterfall Steals Your Blues Away, collage on paper, 16 in X 12 in, 2016. 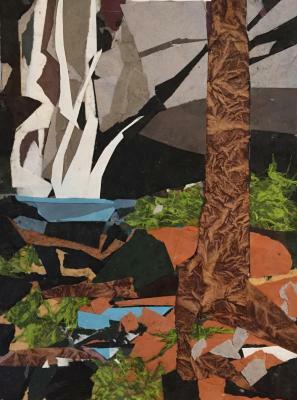 Mariella Bisson, Saunderskill with Fallen Log, Collage, 38 in X 50 in, 2001. 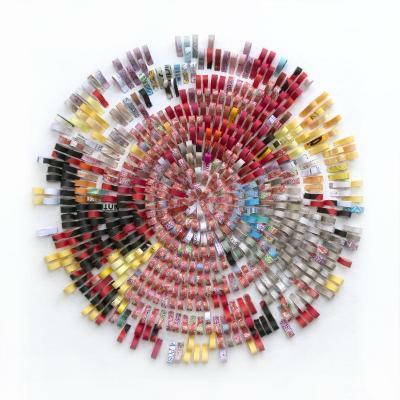 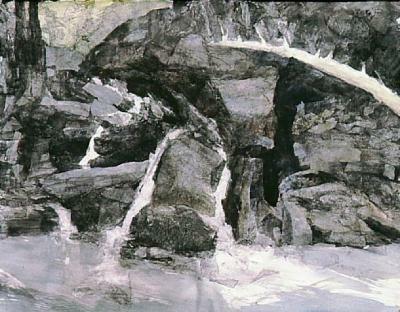 Mariella Bisson, Bridal Veil Falls, Collage, 50 in X 38 in, 2005. 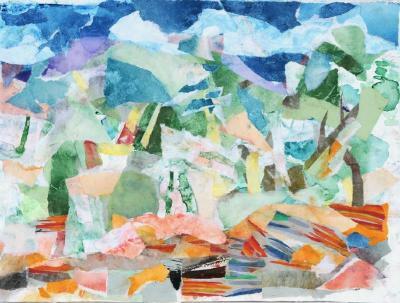 Mariella Bisson, Fishing Place, Red River Colorado, Collage, 30 in X 22 in, 2002. 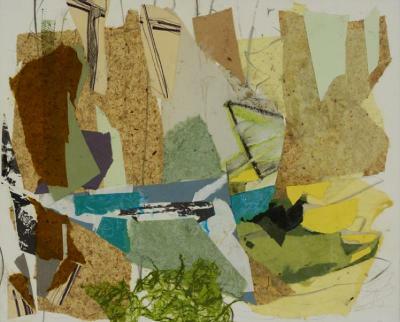 Mariella Bisson, Grunewald (Green Woods), Collage, 12 in X 16 in, 1996. 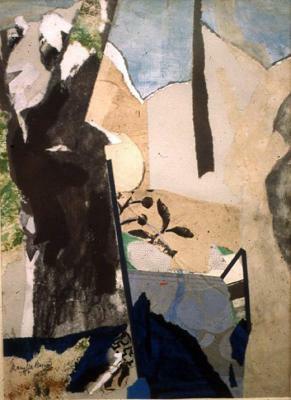 Mariella Bisson, Joyce Kilmer Park, Collage, 15 in X 11.25 in, 1982. 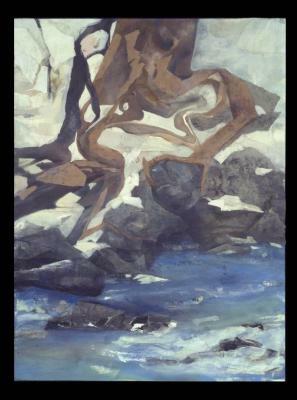 Mariella Bisson, Layers of Past Oceans, Collage, 13 in X 10 in, 2003. 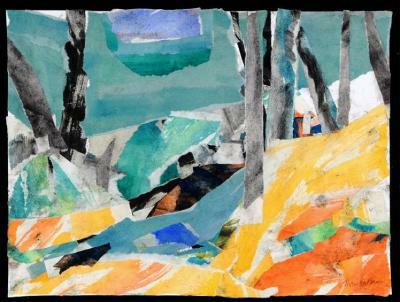 Mariella Bisson, Walk with Kandinsky, Collage, 12 in X 15.75 in, 1996. 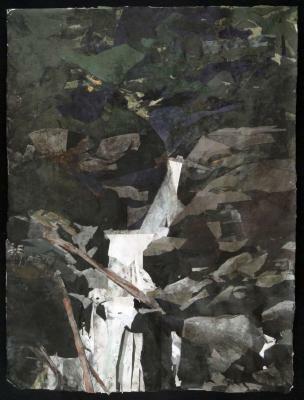 Mariella Bisson, Rock Cliff Waterfall, collage on paper, 16 in X 12 in, 2016. 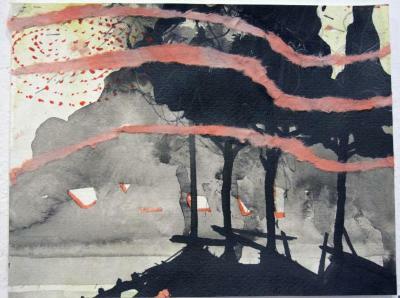 Mariella Bisson, Walk in the Wind, Walk in the Woods, Collage with charcoal, watercolor and monoprint, 16 in X 20 in, 2017. 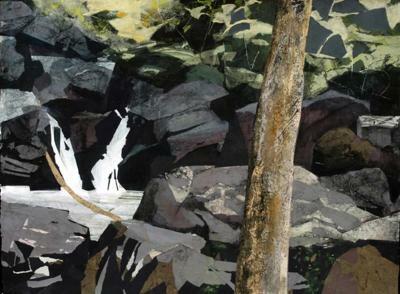 Mariella Bisson, Tallulah Creek Falls, Collage on paper, 22 in X 30 in, 2007. 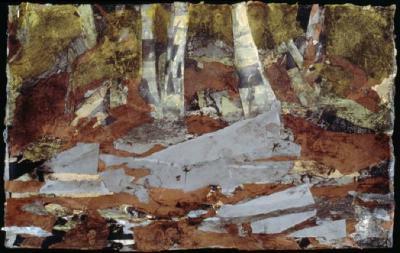 Mariella Bisson, Yellow Birches, Collage on paper, 14 in X 22.5 in, 2005. 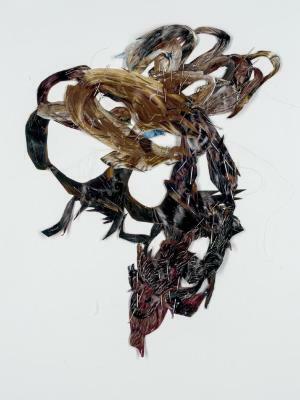 Hedwig Brouckaert, A knot, a tangle, a blemish in the eternal smoothness (1d), Collage, 12 in X 9 in, 2014. 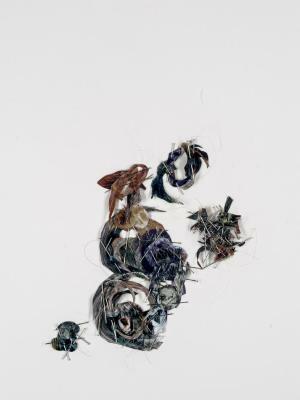 Hedwig Brouckaert, A knot, a tangle, a blemish in the eternal smoothness (1e), Collage, 12 in X 9 in, 2014. 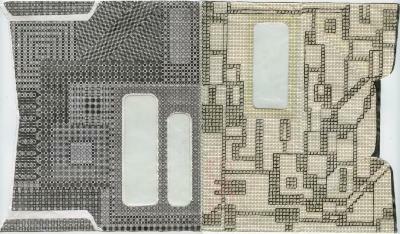 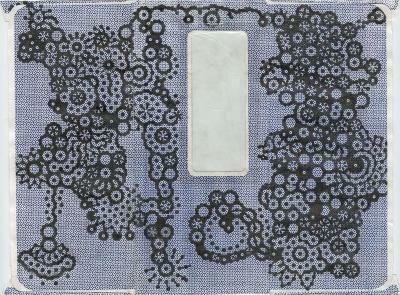 Elizabeth Duffy, Security Envelope Collage, pencil on security envelopes, 15.5 in X 8.5 in, 2005 – 2014. 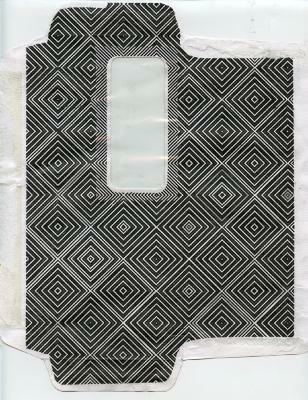 Elizabeth Duffy, Security Envelope Drawing, pencil on security envelopes, 15.75 in X 9.25 in, 2003 – 2013. 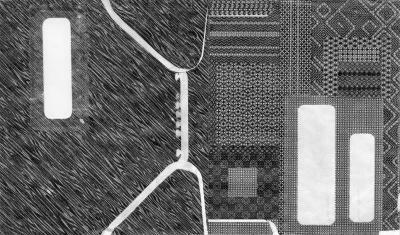 Elizabeth Duffy, Fire Insurance, pencil on security envelopes, 9.25 in X 7 in, 2017. 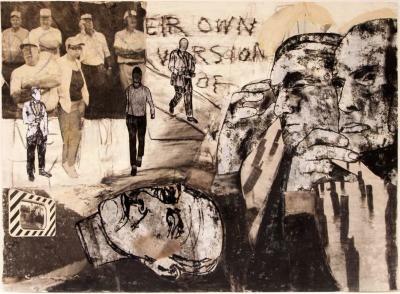 Sally Gil, AT ONE SITTING , Collage and paint on paper , 15.5 in X 11.25 in, 2011. 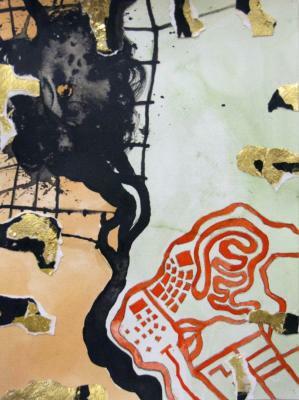 Tatana Kellner, Sympton I, Collage, 9.5 in X 14 in, 2006. 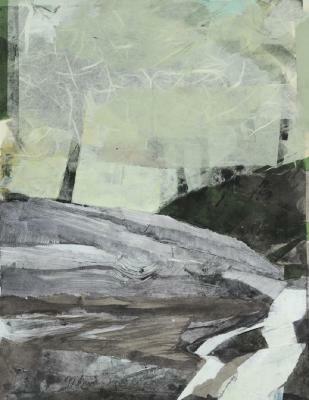 Tatana Kellner, Sympton II, Collage, 9.5 in X 14 in, 2006. 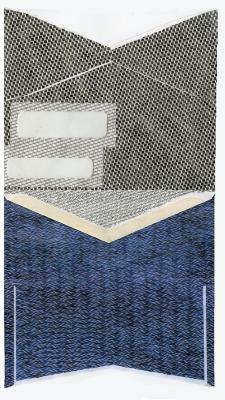 Tatana Kellner, Sympton III, Collage, 9.5 in X 14 in, 2006. 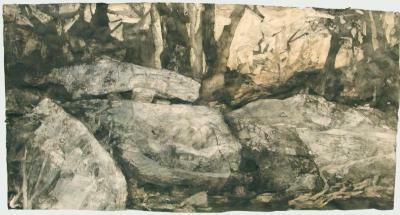 Tatana Kellner, Sympton IV, Collage, 9.5 in X 14 in, 2007. 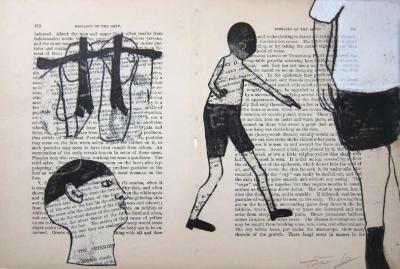 Tatana Kellner, Their Own, Collage, 27.75 in X 39.25 in, 2006. 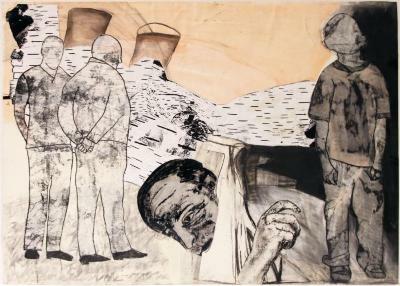 Tatana Kellner, Untitled, Collage, 27.75 in X 39.25 in, 2006. 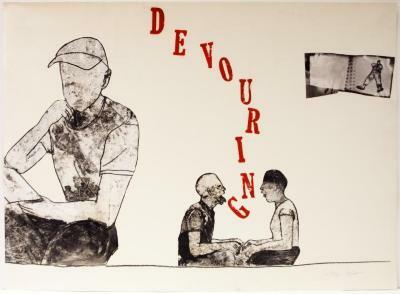 Tatana Kellner, Devouring, Collage, 28 in X 39.25 in, 2006. 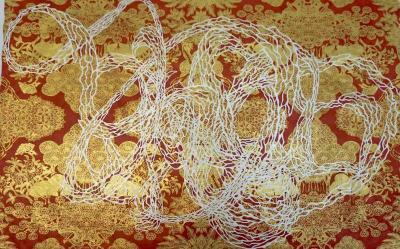 Susan Knight, Vortex Paradise, hand-cut Tyvek on paper on Nepal paper, 20 in X 30 in, 2016. 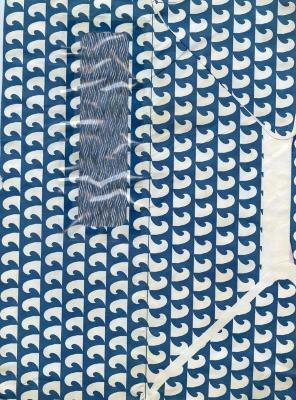 Susan Knight, Vortexing III, hand-cut paper and Tyvek, Tibet Temple paper and Nepal paper, 20 in X 28 in, 2016.